Dancing in the Rain: How Do I Love Thee? Update 3/27/12: I love this post so much because I was able to articulate exactly how I feel about my husband. I wrote this in the aftermath of Mark's heart bypass surgery. That was a year and a half ago. Just this month, I almost lost Mark again. Everything below still holds true....except we keep getting closer to losing him. ...Let me count the ways. The love I feel for my husband amazes me. That sounds like an odd thing to say because I wouldn't have married him if I didn't love him. But I absolutely did not love him then as I do now. Ours is a love that has grown and matured and deepened over the years. On your wedding day you think you love your spouse-to-be madly, passionately, above any other, and you will til the day you die! But you really have no idea what that means as you're standing there saying vows, professing your undying devotion to this person. I believe that if you marry the person you were meant to, the true "depth and breadth and height" of the love between you unfolds over time, through your shared experiences as you make your way through life together. Everything I've ever read about who Mark and I are astrologically says NO! Scorpio + Aries = Bad. The Chinese zodiac tells us Monkey + Tiger = Bad. I guess this is because we can both be hot-headed and stubborn so we are prone to volatility. While we indeed have had pretty heated arguments, we always come back to our mutual love and respect for each other. We both believe that if you don't fight, you don't care. We are also both very loyal and steadfast. And I think our stubbornness is a GOOD thing in our marriage because we aren't about to let what we've built together go without a fight! Regardless of what "they" say, Mark is a mate to my soul, the "great love of my life". I know this like I know my name. We are connected, as if there is a string running between our two bellies. The string is short when we are together and lengthens when we are apart. I know I was meant to love him, and he to love me. We were meant to go through life together, to take care of each other. We have endured and overcome and forged ahead. There is nothing spectacular about us, nothing overly special or "shiny". What we have is just real and true and strong. We enjoy making each other happy. And then we have these two gorgeous children! Camryn is my dream come true and AJ is my hope for the future. Literally. Having Cami was the realization of my Dream to be a mother, and having AJ meant I had overcome my fears and instead grabbed onto Hope. I am so very proud of the little family we have made! Is it any wonder why recent events have been so traumatizing? We have been through A LOT in the last 16 years, lots of ups and downs, lots of dealing with Mark's health problems. But none of it compares to coming so close to losing Mark as we did when his heart stopped 3 times during the "night from hell". There has literally not been anything scarier than that. Nothing scarier than learning there was an infection in his blood surrounding his heart. I had no control over any of this. I had to put my trust in the medical professionals trained to make him well....and pray my little heart out. The one thing I had going for me is that I knew he didn't want to leave us. I knew he wanted to stay here, stay with us. He wasn't ready to go and I knew he would fight. Because that's what Mark does. He is the definition of a fighter. But he is not invincible and matters of life and death are not ultimately under our control. And anyway, just how much can one body take?? So I was still scared. And I was torn. Torn between staying vigil at the hospital all night long, and being with, and there for, our children. I mean, there is very little that can't be made better by a hug from a child! Since having children one thing I have been determined to do is let all this scary medical stuff effect them as little as possible, to disrupt their sweet little lives as little as possible. That's not to say that I believe in sheltering them, because I don't. But they are just kids after all, and shouldn't be burdened if we can help it. Ever since my friend Emily died, leaving her husband and 2 children, I have been all the more aware that that DOES happen. You CAN lose your spouse before you're old. You can be left a widow or widower while you're still young. I have been very worried about that happening to me. I swear I do try not to dwell on that possibility in my day-to-day life! But then it was right there, in my face. And now it is haunting me. I think I need to stop here for now. I feel like I'm gonna start rambling. Bottom line is, I still love and need my husband very much, and our children do to, and am not ready to lose him anytime soon. So there. Mark's heart stopped 3 times in your night from Hell. My heart stopped at least 3 times reading this - and all your posts - and as always, admiring your courage and grace from over hear in the sidelines. Thank you for giving me the opportunity to share it with new readers! I think your love is amazing. And how you describe your love for each other just made me tear up. THAT, is true love, my friend. Mark is a fighter, and so are you. Keep fighting the good fight. 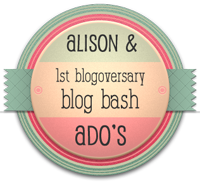 Thank you for sharing this post with us for Blog Bash! You have such a beautiful way with words. You express yourself so well that I can feel the love you share. You are so blessed to have each other.